Sevier County (/səˈvɪər/ "severe") is a county of the U.S. state of Tennessee. As of the 2010 census, the population was 89,889. Its county seat and largest city is Sevierville. 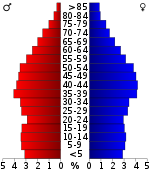 Sevier County comprises the Sevierville, TN Micropolitan Statistical Area, which is included in the Knoxville-Morristown-Sevierville, TN Combined Statistical Area. According to the U.S. Census Bureau, the county has a total area of 598 square miles (1,550 km2), of which 593 square miles (1,540 km2) is land and 5.2 square miles (13 km2) (0.9%) is water. The southern part of Sevier County is located within the Great Smoky Mountains, and is protected by the Great Smoky Mountains National Park. The northern parts of the county are located within the Ridge-and-Valley Appalachians. Sevier contains the highest point in Tennessee, Clingmans Dome, which rises to 6,643 feet (2,025 m) along the county's border with North Carolina. Mount Guyot, located in the Eastern Smokies in the extreme eastern part of the county, is the state's second-highest mountain at 6,621 feet (2,018 m). The 6,593-foot (2,010 m) Mount Le Conte, a very prominent mountain visible from much of the central part of the county, is the state's third-highest. Sevier County is drained primarily by the French Broad River, which passes through the northern part of the county. A portion of the French Broad is part of Douglas Lake, an artificial reservoir created by Douglas Dam in the northeastern part of the county. The three forks of the Little Pigeon River (East, Middle, and West) flow northward from the Smokies, converge near Sevierville, and empty into the French Broad north of Sevierville. The West Fork is the best known, as it flows through the popular tourist areas of Gatlinburg and Pigeon Forge. The maximum elevation differential in Sevier County is the greatest in Tennessee, ranging from a high of 6,643 feet (2,025 m) at Clingmans Dome to a low of 850 feet (260 m) at the French Broad River. As of the census of 2010, there were 89,889 people, 37,583 households, and a homeownership rate of 68.7 percent, below the state average. The population density was 120 inhabitants per square mile (46/km2). There were 37,252 housing units at an average density of 63 per square mile (24/km2). The racial makeup of the county was 97.27% White, 0.56% Black or African American, 0.32% Native American, 0.55% Asian, 0.02% Pacific Islander, 0.42% from other races, and 0.85% from two or more races. 1.24% of the population were Hispanic or Latino of any race. The head of the Sevier County government, the county mayor (known as county executive until 2003), is elected in county-wide elections. The mayor serves along with a 25-member board of elected commissioners representing districts covering the many small communities spread across the county. Sevier County, like most of East Tennessee, votes strongly Republican in Presidential elections. The last election in which a Republican failed to carry it was in 1912, when the Progressive Theodore Roosevelt carried it. It has not been carried by a Democrat since 1832, when it went for Andrew Jackson. In 1916 it gave Charles Hughes 90.38 percent of the vote—reportedly his highest percentage of any county in the nation. In 1932 Herbert Hoover received 77.01% of the vote and in 1936 Alf Landon received 77.73%. Since 1916 no Republican candidate has received less than 55% of the county's vote and in 2008 John McCain received 73.4%. All of the county's state legislators are Republicans, and Republican candidates routinely garner well over 70 percent of the vote on the occasions they face opposition at all. From its beginnings as a traditional subsistence-based farming society, Sevier County has grown into a major tourist destination since the establishment of the Great Smoky Mountains National Park, which dominates the southern portion of the county. One of the very reasons for the park's creation, however, was also one of the county's first major economic engines: the lumber industry. Establishments in what is now the national park felled large amounts of timber in the early 1900s. Though the park effectively killed the logging industry in the late 1930s, it spurred the development of one of the largest tourist resorts in the United States of America, as the Great Smoky Mountains National Park is now the most visited national park in the country. In recent years the tourism bubble has expanded beyond the city of Gatlinburg, which borders the northwestern segment of the national park, and into the nearby cities of Pigeon Forge and Sevierville. Great Smoky Mountains National Park, southern Sevier County: Established in 1936 and propelling the tourism industry in Sevier County ever since, the national park is the most visited in the entire system, welcoming over 10 million nature enthusiasts every year, most of which arrive through Sevier County. Dollywood, Pigeon Forge: The theme park named for part-owner Dolly Parton (who was born in Locust Ridge) admits 2.2 million guests a year, making it both the most popular theme park and most frequented attraction (after the Great Smoky Mountains National Park) in Tennessee. Ripley's Aquarium of the Smokies, Gatlinburg: Opened in 2000 and designated the most visited aquarium in the United States in 2001, when over 2 million tourists passed through its galleries, Ripley's Aquarium of the Smokies is the largest single tourist draw in Gatlinburg. Ober Gatlinburg, Gatlinburg: The Ober Gatlinburg ski resort sits above Gatlinburg, offering numerous attractions for visitors unique to the county, including winter ski slopes and an indoor ice skating rink. The tramway that takes visitors to and from the resort is touted as "America's Largest Aerial Tramway." Smoky Mountain Opry, Pigeon Forge: A musical revue stage show that debuted in 2011. It offers both that program during the majority of the year, as well as the "Christmas Spectacular" during the winter months. 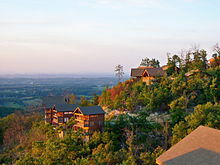 Foxfire Mountain Themed Adventure Park, Sevierville: A 150-acre wilderness theme park located in the foothills of the Great Smoky Mountains offers a wide range of outdoor adventures including: zip lining, ATV tours, climbing walls, free-fall jumps, aerial adventure courses, hiking trails and America's longest swinging bridge. The Sevier County school system is composed of thirty-two public and private institutions ranging from Head Start programs through a number of secondary schools. In addition, two post-secondary institutions have campuses within the county. There are two post-secondary institutions in the county, both located in Sevierville. The first is a satellite campus of the Morristown-based Walters State Community College. The second is a satellite campus of Johnson City-based East Tennessee State University. The massive development of the tourism industry in Sevier County in recent years, while blessing the county with good economic fortunes, has put a major stress on the county's roadways. In an effort to control this the county has put forth numerous projects to widen existing highways, and the cities of Pigeon Forge and Gatlinburg have also implemented a bus service oriented towards visitors, which ferries tourists to and from various popular destinations throughout the towns via decorated buses referred to as "trolleys." The Great Smoky Mountains Parkway connects Interstate 40 (Exit 407) to the national park via the cities of Sevierville, Pigeon Forge, and Gatlinburg. From the exit, the Parkway follows Tennessee State Route 66 ("Winfield Dunn Parkway") into Sevierville, where it becomes U.S. Route 441/Tennessee State Route 71 as TN-66 terminates at a four-way intersection where US-441 splits from U.S. Route 411 and changes direction. It continues along US-441 through Pigeon Forge and Gatlinburg, before entering the national park, where it ascends to the crest of the Smokies at Newfound Gap and crosses into North Carolina (although by this time it is no longer known as the "Great Smoky Mountains Parkway"). The Parkway is joined U.S. Route 321 in Pigeon Forge and they run concurrently until US-321 splits away in downtown Gatlinburg. Along this stretch of U.S. and Tennessee highways, a nearly continuous tourist sprawl (separated only by a spur route of the Foothills Parkway, known as "the spur") has emerged in the three communities. Sevier County, like much of rural Southern Appalachia, consists of relatively few incorporated municipalities and numerous unincorporated settlements. Gatlinburg was the site of the showdown between Sue and his father in the Johnny Cash hit, "A Boy Named Sue". ^ Beulah Duggan Linn, "Sevier County," Tennessee Encyclopedia of History and Culture. Retrieved: March 29, 2013. ^ Trail of Tears, National Park Service. Retrieved: March 29, 2013. ^ Origins of Tennessee County Names, Tennessee Blue Book, 2005, p. 512. ^ Temple, East Tennessee and the Civil War, pp. 381-383. ^ Tom Dunigan, "Tennessee County High Points," Tennessee Landforms, November 2, 2012. Retrieved: March 29, 2013. ^ Leip, David. "Dave Leip's Atlas of U.S. Presidential Elections". uselectionatlas.org. Retrieved March 12, 2018. ^ Great Smoky Mountains National Park-infoplease.com Ten Most Visited National Parks. Infoplease.com. Retrieved: March 29, 2013. ^ David Williams, "Will Fish Lure Tourists to Atlanta?" CNN.com, November 21, 2005. Retrieved: March 29, 2013. ^ Mike Doyle, "Ober Gatlinburg Ski Area Archived February 9, 2007, at the Wayback Machine," About.com. Retrieved: March 29, 2013. ^ "Sevier County Campus". ws.edu. ^ "Sevierville Center". www.etsu.edu. Retrieved March 11, 2018. ^ Pigeon Forge Trolley. Retrieved: March 29, 2013. ^ Gatlinburg Trolley Department Archived July 4, 2006, at the Wayback Machine. Retrieved: March 29, 2013. 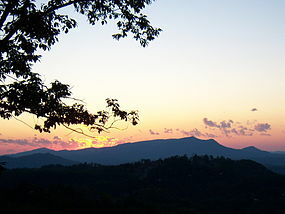 Wikimedia Commons has media related to Sevier County, Tennessee.